The world has a narrowing window of opportunity to get on track to realize the goals of the Paris climate agreement. But leaders must act now and decisively to deliver a key set of climate actions, otherwise the possibility of a safer climate future may slip away. Accelerating progress on a suite of 24 realistic actions by 2030 can put the world on track to stay under 2°C (3.6°F) of temperature rise, and closer to a path that scientists say is needed to stay at the safer level of 1.5°C (2.7°F) of warming. These are the findings of a major new report, “Realizing the Promise of Paris: Roadmap to a Safer Climate Future,” released by NRDC and NewClimate Institute, a well-respected research organization that analyzes climate trends and solutions. In 2015, all countries committed through the Paris climate agreement to the goal of limiting global temperature rise to well below 2°C, and “pursuing efforts” to hold the increase to 1.5°C. Last year, the world’s leading body of climate scientists, the Intergovernmental Panel on Climate Change (IPCC), issued a sobering report showing that 1.5°C of warming could occur sooner and with stronger impacts than previously anticipated. Leaders therefore need to take “rapid and far-reaching” action to cut emissions now in order to avoid the serious climate impacts of which the IPCC warns. Our report provides a clear roadmap for leaders and concerned citizens to put the world on a path toward achieving the goal of the Paris agreement. The report assesses 24 practical and realistic actions to implement between now and 2030. Many of the actions in this roadmap are already underway, and all of them are immediately doable. This includes such actions as deploying more renewable energy, transitioning away from coal, accelerating electric vehicle deployment, ending deforestation, and boosting building, industrial, and energy efficiency. The actions are based on efforts that are already the subject of some level of attention by key countries and sectors and therefore aren’t simply theoretical—they are measures that some set of stakeholders is trying to deliver. Actions are grouped into three categories based on current level of stakeholder commitment and projected trends: On Track, Scale Up, and Need Focus. Implementing all 24 actions in the roadmap can reduce emissions by approximately 19 gigatonnes in 2030, nearly three times the current annual emissions of the United States. Implementing the 19 actions in the "On Track" and "Scale Up" categories can put the world on the outer range of a pathway needed in 2030 to hold global warming to below 2°C. And implementing the five additional actions in the "Need Focus" category would put the world squarely on a 2030 pathway to hold global warming below 2°C, and closer to a pathway needed to limit warming to 1.5°C. And delivering reductions at the maximum range of the potential identified in our report, as well as implementing additional actions not included in the report, provides opportunities to put the world further along the path to a safer climate future. The estimated emissions reductions from these 24 actions, while very substantial, are not yet commensurate with what science says is required to prevent temperature increases from exceeding 1.5°C. 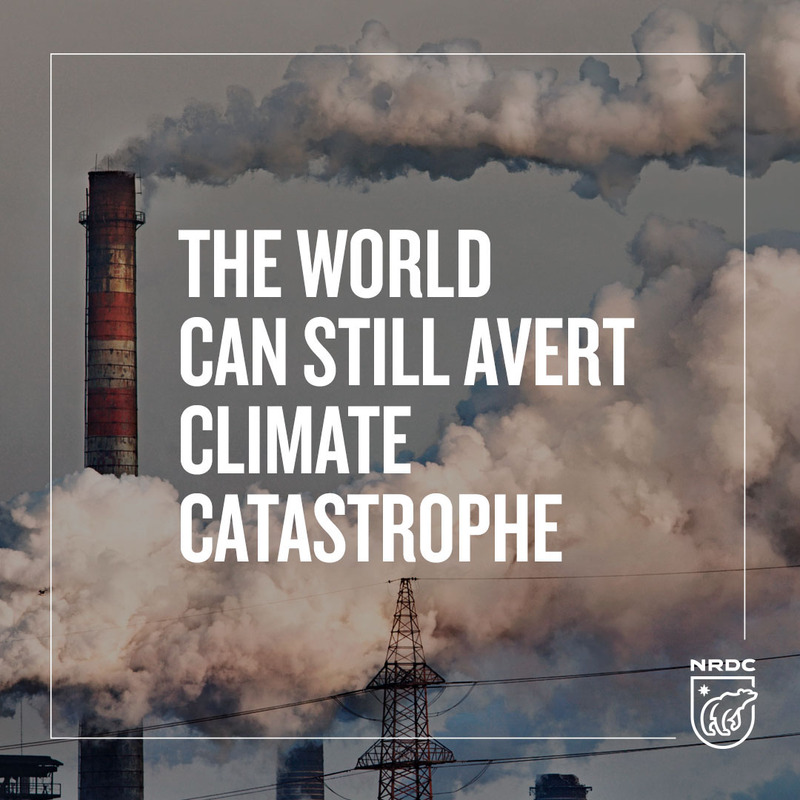 NRDC is committed to making every effort to put the world on a path that avoids temperature increase of 1.5°C and the significant associated harms to people, economies, and natural systems. The measures examined in our report are not an exhaustive strategy to stay on track for 1.5°C of global warming, but should be viewed as a down payment on the effort that all countries must make starting now and concertedly through the next twelve years to minimize additional temperature increase. The first major milestone in this roadmap is for all countries to strengthen their Paris targets immediately and by 2020 at the latest, in line with the deep reductions demanded by the latest science. And countries have a golden opportunity to bring just such a revamped contribution to a major climate change summit to be hosted by the United Nations Secretary-General in September. Simultaneously, key decision makers at all levels—governors, mayors, CEOs, and citizens—must accelerate the actions in this roadmap and additional actions to enable countries to meet and surpass their Paris targets. We need all hands on deck to turbocharge climate action to the needed pace and scale. Realizing the full promise of the Paris Agreement, through the 24 actions contained in this roadmap and others, should be the defining global climate change undertaking of the next twelve years. By delivering on the potential of these actions, we can avert many of the bleak impacts forewarned by climate scientists and leave our children a legacy of a safer and healthier climate. The challenge and the opportunity are clear: now is the time for true leaders to step up to avert climate catastrophe.